1 Deliver me from my enemies, O my God: Out of the reach of those who arise against me set me on high. 3 For, see, they have lain in wait for my soul, The violent gather together against me: Not for transgression or sin of mine, Jehovah. 4 Without [my] fault they run and set themselves in array: Awake to meet me, and behold. 5 And Thou, Jehovah, God of hosts, God of Israel, Rouse Thyself to visit all the nations: Be not gracious to wicked apostates. Selah. 6 They return at evening, they snarl like dogs, and prowl round the city. 7 See, they foam at the mouth; Swords are in their lips: For "Who hears?" 8 But Thou, Jehovah, shalt laugh at them; Thou mockest at all the nations. 9 My Strength, for Thee will I watch: For God is my high tower. 10 My God shall come to meet me with His loving-kindness: God will let me look on my adversaries. 11 Slay them not, lest my people forget: Make them wanderers by Thy power (army? ), and cast them down, O Lord our shield. 12 [Each] word of their lips is a sin of their mouth, And they snare themselves in their pride, And for the cursing and lying [which] they speak. 13 End [them] in wrath, end [them], that they be no more: And let them know that God is ruler in Jacob, Unto the ends of the earth. Selah. 14 And they shall return at evening, they shall growl like dogs, And prowl round the city. 15 They--they shall wander about for food, If they are not gorged, then [so must] they pass the night. 16 And I will sing Thy strength, And sound aloud Thy loving-kindness in the morning, For Thou hast been a high tower for me, And a refuge in the day of my straits. 17 My strength, to Thee will I harp, For God is my high tower, the God of my loving-kindness. The superscription makes this the earliest of David's psalms, dating from the Sauline persecution. It has many points of connection with the others of that group, but its closest affinities are with Psalm lv., which is commonly considered to belong to the period of incubation of Absalom's rebellion (cf. Psalm lv. 10 with lix. 6, 14, and lv. 21 with lix. 7). The allusion to enemies patrolling the city, which is common to both psalms, seems to refer to a fact, and may in this psalm be founded on the watchfulness of Saul's emissaries; but its occurrence in both weakens its force as here confirmatory of the superscription. It does not necessarily follow from the mention of the "nations" that the psalmist's enemies are foreigners. Their presence in the city and the stress laid on words as their weapons are against that supposition. 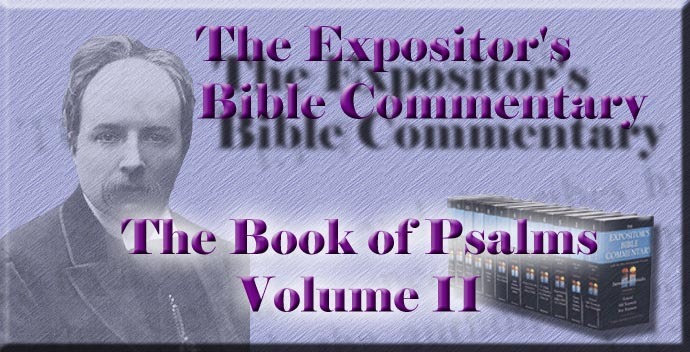 On the whole, the contents of the psalm do not negative the tradition in the title, but do not strongly attest it. If we have accepted the Davidic authorship of the other psalms of this group, we shall extend it to this one; for they clearly are a group, whether Davidic or not. The psalm falls into two principal divisions (vv. 1-9 and 10-17), each closing with a refrain, and each subdivided into two minor sections, the former of which in each case ends with Selah, and the latter begins with another refrain. The two parts travel over much the same ground of petition, description of the enemies, confidence in deliverance and in the defeat of the foes. But in the first half the psalmist prays for himself, and in the second he prays against his persecutors, while assured confidence in his own deliverance takes the place of alarmed gaze on their might and cruelty. The former half of the first part begins and ends with petitions. Imbedded in these is a plaintive recounting of the machinations of the adversaries, which are, as it were, spread before God's eyes, accompanied with protestations of innocence. The prayers, which enclose, as in a circlet, this description of unprovoked hatred, are varied, so that the former petitions are directed to the singer's deliverance, while the latter invoke judgment on his antagonists. The strong assertion of innocence is, of course, to be limited to the psalmist's conduct to his enemies. They attack him without provocation. Obviously this feature corresponds to the facts of Saul's hatred of David, and as obviously it does not correspond to the facts of Israel's sufferings from foreign enemies, which are supposed by the present favourite interpretation to be the occasion of the psalm. No devout singer could so misunderstand the reason of the nation's disasters as to allege that they had fallen upon innocent heads. Rather, when a psalmist bewailed national calamities, he traced them to national sins. "Anger went up against Israel, because they believed not in God." The psalmist calls God to look upon the doings of his enemies. Privy plots and open assaults are both directed against him. The enemy lie in wait for his life; but also, with fell eagerness, like that of soldiers making haste to rank themselves in battle-array, they "run and set themselves." This is probably simply metaphor, for the rest of the psalm does not seem to contemplate actual warfare. The imminence of peril forces an urgent prayer from the threatened man. So urgent is it that it breaks in on the parallelism of ver. 4, substituting its piercing cry "Awake, behold!" for the proper second clause carrying on the description in the first. The singer makes haste to grasp God's hand, because he feels the pressure of the wind blowing in his face. It is wise to break off the contemplation of enemies and dangers by crying to God. Prayer is a good interruption of a catalogue of perils. The petitions in ver. 5 are remarkable, both in their accumulation of the Divine names and in their apparent transcending of the suppliant's need. The former characteristic is no mere artificial or tautological heaping together of titles, but indicates repeated acts of faith and efforts of contemplation. Each name suggests something in God which encourages hope, and when appealed to by a trusting soul, moves Him to act. The very introductory word of invocation, "And Thou," is weighty. It sets the might of God in grand contrast to the hurrying hatred of the adversary; and its significance is enhanced if its recurrence in ver. 8 and its relation to "And I" in ver. 16 are taken into account. The combination of the Divine names is remarkable here, from the insertion of God (Elohim) between the two parts of the standing name, Jehovah of hosts. The anomaly is made still more anomalous by the peculiar form of the word Elohim, which does not undergo the modification to be expected in such a construction. The same peculiarities occur in other Elohistic psalms (lxxx. 4, 19, and lxxxiv. 8). The peculiar grammatical form would be explained if the three words were regarded as three co-ordinate names, Jehovah, Elohim, Zebaoth, and this explanation is favoured by good critics. But it is going too far to say, with Baethgen, that "Zebaoth can only be understood as an independent Divine name" (Komm., in loc.). Other explanations are at least possible, such as that of Delitzsch, that "Elohim, like Jehovah, has become a proper name," and so does not suffer modification. The supplicatory force of the names, however, is clear, whatever may be the account of the formal anomalies. They appeal to God and they hearten the appellant's confidence by setting forth the loftiness of God, who rules over the embattled forces of the universe, which "run and set themselves in array" at His bidding and for His servant's help, and before which the ranks of the foes seem thin and few. They set forth also God's relation to Israel, of which the single suppliant is a member. The petition, grounded upon these names, is supposed by modern commentators to prove that the psalmist's enemies were heathens, which would, of course, destroy the Davidic authorship, and make the singer a personification of the nation. But against this is to be observed the description of the enemies in the last clause of ver. 5 as "apostates," which must refer to Israelites. The free access to the "city," spoken of in ver. 6, is also unfavourable to that supposition, as is the prominence given to the words of the enemy. Foreign foes would have had other swords than those carried between their lips. The prayer that Jehovah would arise to visit "all nations" is much more naturally explained, as on the same principle as the judgment of "the peoples" in Psalm vii. All special cases are subsumed under the one general judgment. The psalmist looks for his own deliverance as one instance of that world-wide manifestation of Divine justice which will "render to every man according to his deeds." Not only personal considerations move him to his prayer; but, pressing as these are, and shrill as is the cry for personal deliverance, the psalmist is not so absorbed in self as that he cannot widen his thoughts and desires to a world-wide manifestation of Divine righteousness, of which his own escape will be a tiny part. Such recognition of the universal in the particular is the prerogative in lower walks of the poet and the man of genius; it is the strength and solace of the man who lives by faith and links all things with God. The instruments here strike in, so as to fix attention on the spectacle of God aroused to smite and of the end of apostates. The comparison of the psalmist's enemies to dogs occurs in another psalm ascribed to David (xxii. 16, 20). They are like the masterless, gaunt, savage curs which infest the streets of Eastern cities, hungrily hunting for offal and ready to growl or snarl at every passer-by. Though the dog is not a nocturnal animal, evening would naturally be a time when these would specially prowl round the city in search of food, if disappointed during the day. The picture suggests the enemies' eagerness, lawlessness, foulness, and persistency. If the psalm is rightly dated in the superscription, it finds most accurate realisation in the crafty, cruel watchfulness of Saul's spies. The word rendered by the A.V. and R.V. "make a noise" is "said usually of the growling of the bear and the cooing of the dove" (Delitzsch). It indicates a lower sound than barking, and so expresses rage suppressed lest its object should take alarm. The word rendered (A.V. and R.V.) "belch" means to gush out, and is found in a good sense in Psalm xix. 1. Here it may perhaps be taken as meaning "foam," with some advantage to the truth of the picture. "Swords are in their lips"--i.e., their talk is of slaying the psalmist, or their slanders cut like swords; and the crown of their evil is their scoff at the apparently deaf and passive God. With startling suddenness, as if one quick touch drew aside a curtain, the vision of God as He really regards the enemies is flashed on them in ver. 8. The strong antithesis expressed by the "And Thou," as in ver. 5, comes with overwhelming force. Below is the crowd of greedy foes, obscene, cruel, and blasphemous; above, throned in dread repose, which is not, as they dream, carelessness or ignorance, is Jehovah, mocking their fancied security. The tremendous metaphor of the laughter of God is too boldly anthropomorphic to be misunderstood. It sounds like the germ of the solemn picture in Psalm ii., and is probably the source of the similar expression in Psalm xxxvii. 13. The introduction of the wider thought of God's "mocking"--i.e., discerning, and manifesting in act, the impotence of the ungodly efforts of "all nations"--is to be accounted for on the same principle of the close connection discerned by the devout singer between the particular and the general, which explains the similar extension of view in ver. 5. Ver. 9 is the refrain closing the first part. The reading of the Hebrew text, "His strength," must be given up, as unintelligible, and the slight alteration required for reading "my" instead of "his" adopted, as in the second instance of the refrain in ver. 17. The further alteration of text, however, by which "I will harp" would be read in ver. 9 instead of "I will watch" is unnecessary, and the variation of the two refrains is not only in accordance with usage, but brings out a delicate phase of progress in confidence. He who begins with waiting for God ends with singing praise to God. The silence of patient expectance is changed for the melody of received deliverance. The first part of the second division, like the corresponding portion of the fist division, is mainly prayer, but with the significant difference that the petitions now are directed, not to the psalmist's deliverance, but to his enemies' punishment. For himself, he is sure that his God will come to meet him with His loving-kindness, and that, thus met and helped, he will look on, secure, at their ruin. The Hebrew margin proposes to read "The God of my loving-kindness will meet me"--an incomplete sentence, which does not tell with what God will meet him. But the text needs only the change of one vowel point in order to yield the perfectly appropriate reading, "my God shall meet me with His loving-kindness," which is distinctly to be preferred. It is singular that the substitution of "my" for "his," which is needlessly suggested by the Hebrew margin for ver. 10, is required but not suggested for ver. 9. One is tempted to wonder whether there has been a scribe's blunder attaching the correction to the wrong verse. The central portion of this part of the psalm is composed of terrible wishes for the enemies' destruction. There is nothing more awful in the imprecations of the Psalter than that petition that the boon of a swift end to their miseries may not be granted them. The dew of pity for suffering is dried up by the fire of stern desire for the exhibition of a signal instance of Divine judicial righteousness. That desire lifts the prayer above the level of personal vengeance, but does not lighten its awfulness. There may be an allusion to the fate of Cain, who was kept alive and made a "fugitive and a vagabond." Whether that is so or not, the wish that the foes may be kept alive to be buffeted by God's strength--or, as the word may mean, to be scattered in panic-struck rout by God's army--is one which marks the difference between the old and the new covenants. The ground of these fearful punishments is vehemently set forth in ver. 12. Every word which the adversaries speak is sin. Their own self-sufficient pride, which is revolt against dependence on God, is like a trap to catch them. They speak curses and lies, for which retribution is due. This recounting of their crimes, not so much against the psalmist, though involving him, as against God, fires his indignation anew, and he flames out with petitions which seem to forget the former ones for lingering destruction: "End them in wrath, end them." The contradiction may be apparent only, and this passionate cry may presuppose the fulfilment of the former. The psalmist will then desire two dreadful things--first, protracted suffering, and then a crushing blow to end it. His ultimate desire in both is the same. He would have the evil-doers spared long enough to be monuments of God's punitive justice; he would have them ended, that the crash of their fall may reverberate afar and proclaim that God rules in Jacob. "Unto the ends of the earth" may be connected either with "rules" or with "know." In the former construction the thought will be, that from His throne in Israel God exercises dominion universally; in the latter, that the echo of the judgment on these evil-doers will reach distant lands. The latter meaning is favoured by the accents, and is, on the whole, to be preferred. But what a strange sense of his own significance for the manifestation of God's power to the world this singer must have had, if he could suppose that the events of his life were thus of universal importance! One does not wonder that the advocates of the personification theory find strong confirmation of it in such utterances; and, indeed, the only other explanation of them is that the psalmist held, and knew himself to hold, a conspicuous place in the evolution of the Divine purpose, so that in his life, as in a small mirror, there were reflected great matters. If such anticipations were more than wild dreams, the cherisher of them must either have been speaking in the person of the nation, or he must have known himself to be God's instrument for extending His name through the world. No single person so adequately meets the requirements of such words as David. The second part of this division (ver. 14) begins with the same words as the corresponding part of the first division (ver. 6), so that there is a kind of refrain here. The futures in vv. 14, 15, may be either simple futures or optatives. In the latter case the petitions of the preceding verses would be continued here, and the pregnant truth would result that continuance in sin is the punishment of sin. But probably the imprecations are better confined to the former part, as the Selah draws a broad line of demarcation, and there would be an incongruity in following the petition "End them" with others which contemplated the continuance of the enemies. If the verses are taken as simply predictive, the point of the reintroduction of the figure of the pack of dogs hunting for their prey lies in ver. 15. There they are described as balked in their attempts, and having to pass the night unsatisfied. Their prey has escaped. Their eager chase, their nocturnal quest, their growling and prowling, have been vain. They lie down empty and in the dark--a vivid picture, which has wider meanings than its immediate occasion. "Ye lust and desire to have, and cannot obtain." An eternal nemesis hangs over godless lives, condemning them to hunger, after all efforts, and wrapping their pangs of unsatisfied desire in tragic darkness. A clear strain of trust springs up, like a lark's morning song. The singer contrasts himself with his baffled foes. The "they" at the beginning of ver. 15 is emphatic in the Hebrew, and is matched with the emphatic "And I" which begins ver. 16. His "morning" is similarly set over against their "night." So petition, complaint, imprecation, all merge into a song of joy and trust, and the whole ends with the refrain significantly varied and enlarged. In its first form the psalmist said, "For Thee will I watch"; in its second he rises to "To Thee will I harp." Glad praise is ever the close of the vigils of a faithful, patient heart. The deliverance won by waiting and trust should be celebrated by praise. In the first form the refrain ran "God is my high tower," and the second part of the psalm began with "My God shall meet me with His loving-kindness." In its second form the refrain draws into itself these words which had followed it, and so modifies them that the loving-kindness which in them was contemplated as belonging to and brought by God is now joyfully clasped by the singer as his very own, by Divine gift and through his own acceptance. Blessed they who are led by occasion of foes and fears to take God's rich gifts, and can thankfully and humbly feel that His loving-kindness and all its results are theirs, because He Himself is theirs and they are His!